UPDATE: Karzai ticked off that the joint US-Russia operation went off without his permission...? The head of Afghanistan Hamid Karzai has demanded an explanation from NATO command in conjunction with the United States and Russia counter-narcotics operations in Afghanistan. President's Office sent out a statement by Karzai in Kotormo shown an bewilderment at the fact that the operation went "without his permission." Operation narkopolitseyskih U.S., Russia and Afghanistan was held Thursday in the village Zerasari Achin district of Nangarhar province. There have been eliminated four clandestine drug laboratories, confiscated 932 kilograms of heroin, 156 kilograms of opium, transmits ITAR-TASS. Russian and U.S. drug control services have carried out their first joint anti-narcotics operation in Afghanistan, destroying four major drug laboratories, the head of Russia's Federal Drug Control Service said on Friday. Viktor Ivanov, the head of Russia's Federal Anti-Narcotics Committee, said during a joint press conference with Deputy Head of Mission of the U.S. Embassy in Russia Eric Rubin that the operation destroyed four drug labs in Afghanistan on the border with Pakistan. "The operation began on October 28 at 6:30 a.m. and four drug laboratories were destroyed by 10:20 a.m.," Ivanov said, adding the joint operation was carried out by a total of 70 personnel. Ivanov had no information on casualties or the number of detained during the operation. The operation, which took three months of planning, destroyed three heroin labs, including one large drug hub near the village of Achin, and one morphine lab. Ivanov praised joint efforts by Russian and U.S. anti-drug services and said the effective work of a Russian-U.S. presidential commission in the sphere of drug trafficking was a good example of a "reset" in relations between the two countries. He said 932 kilograms (more than 2,000 pounds) of high quality heroin and 156 kilograms (344 pounds) of opium was seized, or 200 million doses with an estimated value of $250 million. Rubin also praised the results of the operation. "This investigation is a very concrete example of real cooperation," he said. "We cannot succeed alone. This was the first step and we will continue to destroy labs." Rubin said that one of the main goals of U.S.-Russian operations in Afghanistan was to "identify, disrupt, and destroy the drug trade." U.S. President Barack Obama and Russian President Dmitry Medvedev emphasized last year that the creation of a joint mission on the fight against drug production and trafficking in Afghanistan "should not consist of just commissions and reports, but of concrete results," Rubin said. However, Ivanov also admitted that "drug infrastructure in Afghanistan is expanding." He said the number of drug laboratories in the country has increased by almost 2.5 times in the past two years, from 175 in 2008 to 425 in 2010. Ivanov said that drug cartels similar to those in Mexico have appeared in Afghanistan and the transit countries of Uzbekistan and Tajikistan. Afghan drug production increased dramatically after the U.S.-led invasion toppled the Taliban in 2001, and Russia has been one of the most affected countries, with heroin consumption rising steeply. Ivanov said approximately 65% of Afghanistan's opium crops are grown in the Helmand Province, one of the most volatile regions in the country, adding that farmers make "around $70 a year by cultivating opium, much more than for growing wheat." An estimated 90 percent of heroin consumed in Russia is trafficked from Afghanistan via Tajikistan and Uzbekistan. What could possibly be better than clown pants? 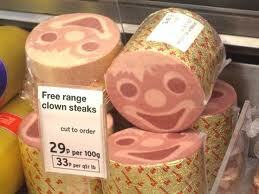 How about clown meat? The narcotics trade in Afghanistan would be impossible without government officials and the Taliban on the payroll, said the man in the brown turban. "The link between them is a natural one." ...According to several Afghan former officials in the region, however, the major drug traffickers in southern Afghanistan don't worry much about getting caught because they're working under the protection of Karzai and other powerful government officials. Interesting America and Russia teaming up ... something rings false here. America has been using these drugs to weaken Russia from within, a carryover from the days when they armed bin Laden and the boys to fight off Russia to break its financial back. It is also strange considering how much cash is involved and ends up in American hands. Russia has been very frustrated over the past few years about the drug matter as I have read before and threatened to go into Afghanistan to end the business. America also keeps Karzai and the warlords happy and they, in turn, keep the opium coming. Who is who here? There is much more to this story than meets the eye. just my take Noor -- it looks like Russia is in a tricky spot here. what are they going to do with this offer, say no? they can't say no after they complained, so they cooperated with the joint effort. but what did they get? three months of planning to make an insignificant dent in the problem. but if they complain they look bad. so i see it as a token gesture from the US that Russia has to accept politely for diplomatic reasons. this does not take into account corruption on the Russian side, which surely exists. Hard to figure sometimes. Those labs could have been in competition with Karzai's ring. agreed dubs. i guess if they had to pick some to shut down, they would pick the competitors. The maths is certainly interesting. In Scotland the SNP government has apparently been cracking down on drugs. So the SNP will have to be chucked out and replaced by the Labour Party, some of whose leaders have been linked to drugs. indeed. the people with drugs are often most popular.